19th Century Japanese Map of Bangkok - very rare! 第四圖 / The Fourth Map. A scarce Meiji 8, 1875 Japanese issue map of the Chao Phraya River from the Bay of Bangkok to the city of Bangkok. Bangkok is depicted on the upper right with some detail, including the city's canal system. Some depths in the Bay of Bangkok are included via shading. 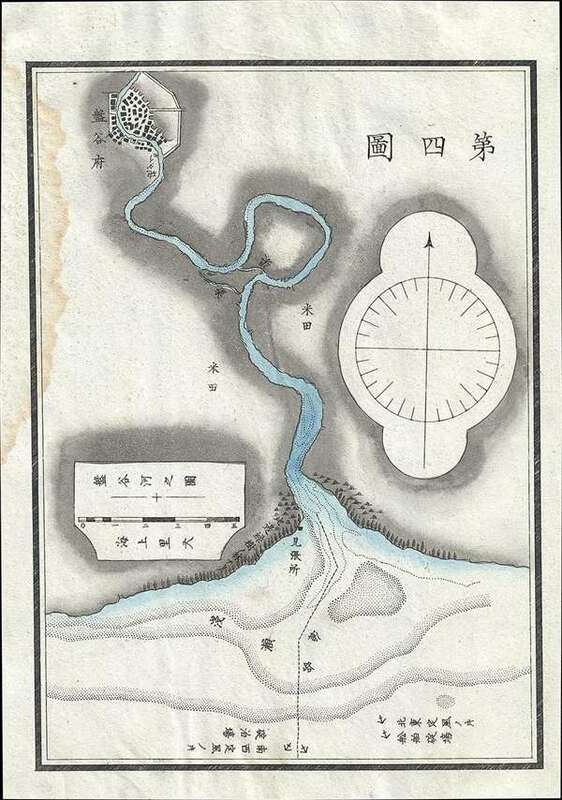 This map, simply titled 'The Fourth Map' was prepared to illustrate an extremely rare Meiji Era Japanese travelogue describing a voyage to Thailand or Siam. We have identified only two other examples of this map located in the archives of the Waseda University Library, Tokyo and the Kyoto University Library, Kyoto. Very good. Water stain upper left corner. Laid down on Japanese tissue, as issued.